Eastern Kodiak Island, including the areas around the north and west arms of Kiliuda Bay and the peninsula south of Kiliuda Bay. See See	area map (Image file 79 kB). A variety of steep slopes from sea level to 4280'. Hunt area is diverse and ranges from tidal flats to rugged peaks with glaciers and permanent snowfields. Grass, alder, willow, and patches of cottonwood trees occupy the lowlands and river valleys. Inland areas composed of foothills and low ridges intersected by numerous drainages, flat benches, and steep ridges. Lands on the north side of Kiliuda Bay are primarily State lands with some private holdings along the coast. 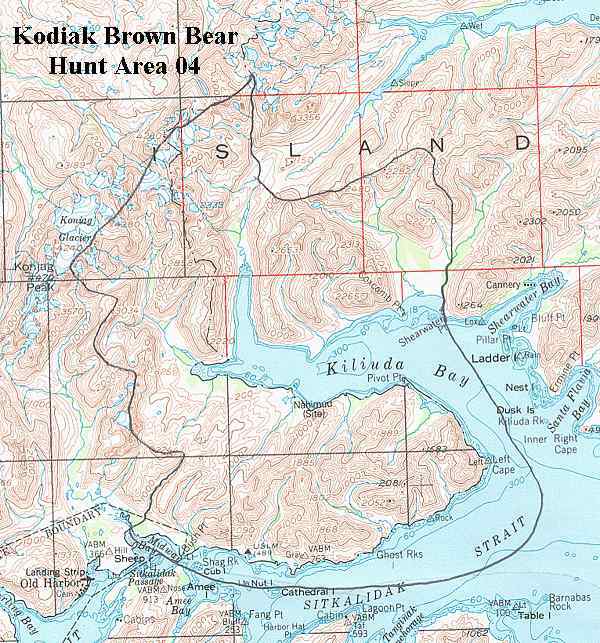 Lands west and south of Kiliuda Bay are primarily Kodiak National Wildlife Refuge lands with some private land and Old Harbor Native Corporation lands along the coastal areas.